For many years, boxing promoters and television executives, egged on by risk-averse managers, forgot about the customer. They put on fights that weren't designed to entertain fans so much as they were to position themselves better for the next big payday. The result was blowout after blowout in safe, non-competitive fights. The problem was that fans were getting increasingly dissatisfied and were essentially giving the sport the cold shoulder. They didn't lose their love of a good fight, but because promoters were making so few matches that could rightly be expected to be a good fight, boxing fans began to spend their entertainment dollars in other areas. But in 2011, someone wised up, and there was a series of great fights. It continued in 2012. And 2013 turned out to be arguably the best year in the century for boxing and one of the best in the last 25 years. There were outstanding fights on television shows big and small. Arena cards were stacked with competitive, entertaining bouts. And promoters, TV executives and managers finally seemed to get the message: You lose when you put together a mismatch, not when you put together a compelling, entertaining fight in which the decision goes against your guy. Ten fights stood out from the pack in a crowded year of excellent fights, however, and those 10 are my finalists for the 2013 Yahoo Sports Boxing Fight of the Year. 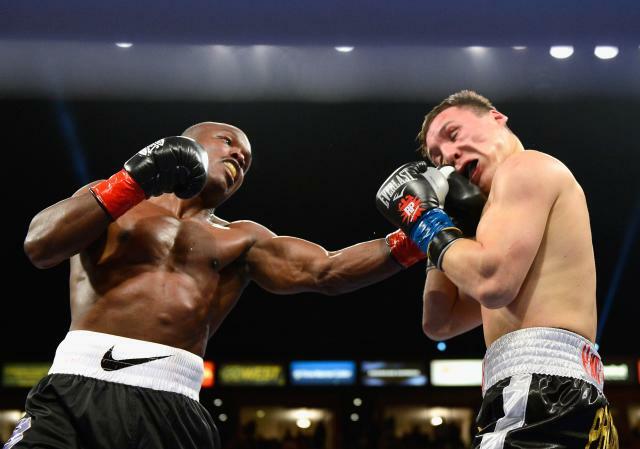 Timothy Bradley W12 Ruslan Provodnikov, March 16 – Bradley was battered and beaten by the hard-hitting Provodnikov in the first two rounds, and the fight could have been stopped. Bradley trainer Joel Diaz urged his man to box, and Bradley responded, sort of. He used a bit of lateral movement, but mostly stood toe-to-toe and slugged with Provodnikov. It nearly cost him, as he was knocked down in the 12th and was in serious jeopardy several other times. But Bradley won the bout as well as a legion of new fans. Mike Alvarado W12 Brandon Rios, March 30 – Perhaps no fight in 2013 had more anticipation in the build-up than Alvarado-Rios II. 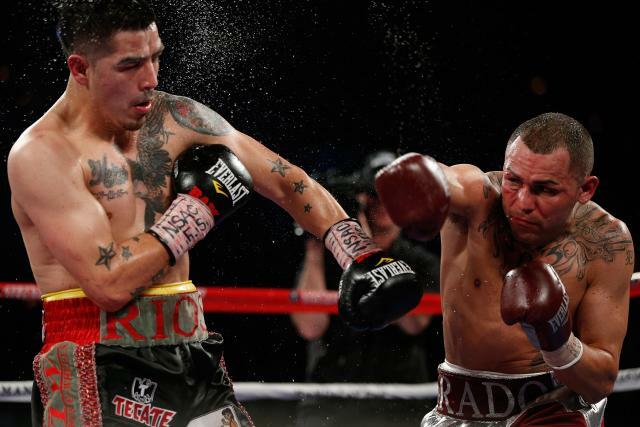 Their first bout, in 2012, had been an incredible battle that Rios won by seventh-round stoppage. The rematch was not quite as much of a slugfest, but it was still filled with terrific action. Erislandy Lara TKO10 Alfredo Angulo, June 8 – Lara has frequently been labeled a boring fighter, but he put on an incredible show against Angulo in Carson, Calif., in this bout for an interim super welterweight title. Lara was blasting Angulo with sharp punches from all angles, but Angulo never stopped pressing forward and dropped Lara in Rounds 4 and 9. Lara, though, recovered and stopped Angulo in the 10th. Marcos Maidana TKO6 Josesito Lopez, June 8 – This bout occurred immediately following Lara-Angulo and was another amazing war of attrition. Lopez is frequently outmanned in his fights, but is so courageous that he just keeps coming and coming and wins fights by refusing to quit. But Maidana is one of boxing's best punchers, and his power eventually forced Lopez to succumb in a phenomenal match. Omar Figueroa W12 Nihito Arakawa, July 27 – Figueroa knocked Arakawa down twice and won a wide decision, but that doesn't tell the story of this fight. The two men exchanged big shots throughout and combined to throw more than 2,100 punches. It was incredible that Arakawa was able to take the punches he did and keep coming back. Fans were on their feet as the fight ended. Giovani Segura KO4 Jonathan Gonzalez, Aug. 17 – Flyweights don't get a lot of attention in the U.S., but if you like action fights, this is a great division. Segura is one of the best and most exciting fighters in the lower weight divisions. In this fight, Segura and Gonzalez exchanged big power shots until the brutal ending. Segura was stronger and finally knocked Gonzalez out, but Gonzalez fights fiercely, and this was a fight to see. Ruslan Provodnikov TKO10 Mike Alvarado, Oct. 19 – This fight was similar to both the Bradley-Provodnikov fight from earlier in the year and Rios-Alvarado I from 2012. There was little subtlety in this one, as each was cracking the other with devastating blows. Provodnikov, though, is the bigger puncher and as the match wore on, his power took over and Alvarado couldn't make it out for the 11th round. Giovani Segura KO12 Hernan "Tyson" Marquez, Nov. 2 – Marquez was the winner in the 2011 Yahoo Sports Fight of the Year when he stopped Luis Concepcion in Panama. This fight with Segura probably tops that for consistent beginning-to-end action, and Segura ends it by putting an exhausted Marquez down for the count in the final round. James Kirkland TKO6 Glen Tapia, Dec. 7 – For two rounds, this fight was like one from the Arturo Gatti-Micky Ward trilogy. Tapia walked out of his corner at the bell and threw a big right hand that hurt Kirkland. But Kirkland was too big and too strong and eventually beat Tapia down. Marcos Maidana W12 Adrien Broner, Dec. 14 – Maidana controlled the bout from beginning to end. His power was hurting Broner repeatedly, but Broner didn't quit. He kept fighting back and, despite an act in the eighth round when he tried to get Maidana disqualified, showed heart many weren't sure he had. Each of these matches had something that would allow them to be named Fight of the Year. But the nod goes to Bradley-Provodnikov. It was a competitive, back-and-forth match, with outstanding skills and courage shown on both sides. There were plenty of momentum swings and each man came back from the brink to do something dramatic. For that reason, the March 16 match between Timothy Bradley and Ruslan Provodnikov is the 2013 Yahoo Sports Fight of the Year.